Codec for VoIP and digital telephones. 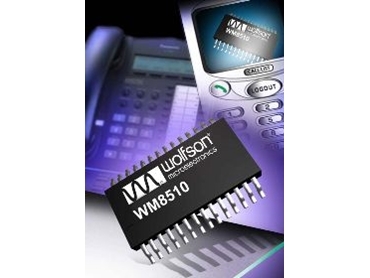 WOLFSON Microelectronics has released the WM8510 mono codec, designed for Voice over Internet Protocol (VoIP) devices and digital telephones. It significantly reduces design costs and external component requirements. It includes a driver for a speaker or headset, two separate microphone inputs and two dedicated analogue audio outputs with volume control. Advanced sigma delta converters are used along with digital decimation and interpolation filters to give high quality audio at sample rates from 8000 to 48,000 samples a second. Additional digital filtering options are available in the ADC path, as is an advanced automatic level control (ALC) function with noise gate. An on-chip PLL is provided to generate the required master clock from an external reference clock. The PLL clock can also be output if required elsewhere in the system. The WM8510 has a standard audio interface supporting transmission of audio data to and from the chip. The interface supports a number of audio data formats including micro-law and alpha-law, PCM, IIS and DSP Mode. It can operate in master or slave modes. The WM8510 operates at supply voltages from 2.5V to 3.6V, although the digital core can operate at voltages down to 1.62V to save power. The speaker and mono outputs use a separate supply of up to 5V, which enables increased output power. Different sections of the chip can also be powered down under software control by way of the selectable two or three-wire control interface. The WM8510 is available in a 28-pin SSOP package.